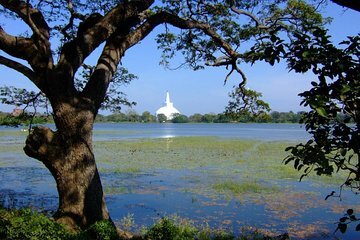 Nowhere captures Sri Lanka’s ancient past better than UNESCO-listed Anuradhapura’s ruins, and this private tour from Colombo, Negombo, or Katunayaka lets you see them in a day—something that's near-impossible independently. Travel through countryside to the crumbled ancient capital and take in highlights such as the Brazen Palace, sacred bodhi tree, and Isurumuniya Temple. Private air-conditioned transport , entrance fees, lunch, and hotel pickup and drop-off are included.